Guide to building and using concept maps. Concept mapping is a technique for articulating, organizing, and communicating knowledge. There are a lot of different techniques out there - the Periodic Table of Visualization Methods is a great place to explore - so, what makes concept mapping unique? It is a lot like brainstorming and mind mapping, since it helps to get information out of our heads and challenges us to articulate the essential concepts or ideas. However, unlike brainstorming and mind mapping, concept mapping asks us to define how these essential components relate to each other. It results in maps that are structured and complex, but also more informative. Concept mapping has a strong theoretical background. Joseph Novak and his research team at Cornell developed the tool in the 1970s (The Origin and Development of Concept Maps). Their work focused on human learning and knowledge creation, with the idea that the single most important factor influencing learning is what the learner already knows. When you create a concept map, you demonstrate your understanding of an area. As you build on what you already know, your map grows and you can visualize the learning process. Maps consist of concepts, that describe events or objects, and their relationships. Concept maps are hierarchical: Concepts are mapped hierarchically, from general to specific, or in a logical order. Concepts are connected: All concepts are linked together with words or phrases that define the relationships. Concepts and linking words form propositions, or statements, so that maps can be read at any point. 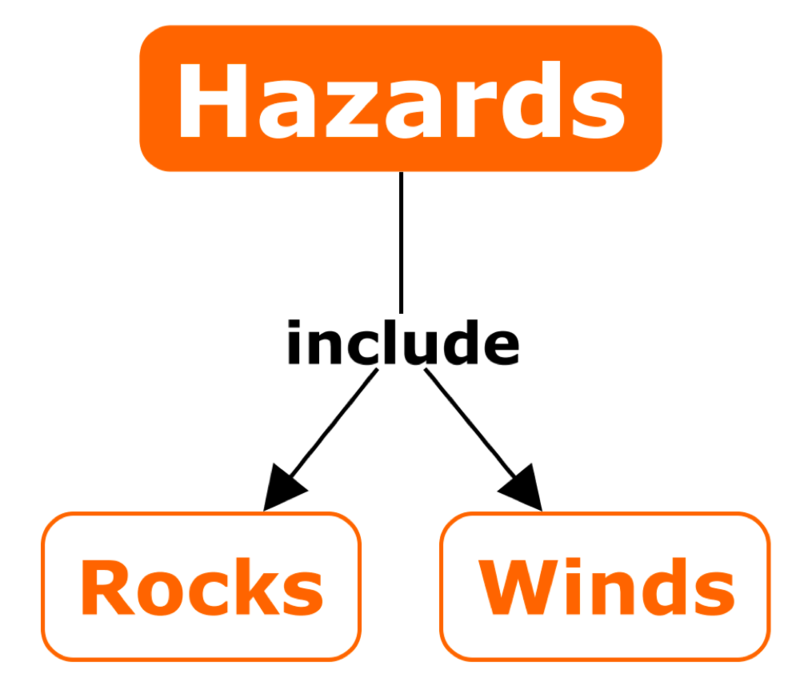 The concepts in the above examples are: 'hazards', 'rocks', 'winds'. The linking word in both cases is 'include'. What makes a good concept map? Isolated: Several concepts are linked to a main concept but with little depth, or branching. Departmental: Maps appear to be made of separate departments or areas that do not connect to each other (no cross links). Integrated: Maps have a well developed hierarchy, and the different departments are linked to each other with cross links. Expert maps can be pre-constructed or created with classroom feedback. Student maps can be individual or group activities. Example map from Berglund of a group activity (2015). Groups of 5-7 students were given 70 concepts to map collaboratively. Instructions to students can be more or less directed. Example using a focus question, with and without concepts, and providing a skeleton map (Novak & Cañas, 2008). Example using an assigned reading to test for comprehension. Compare student maps to pre-constructed expert maps. Fill in the blanks activities can used for assessment or to offer immediate feedback. Concept mapping is a reflective activity that can be used for self-evaluation. Maps can be used in the field and as study aids. Maps can serve as communication tools. Contact me for one-on-one support or to book a group workshop.